1) We developed a new methodology for designing technologies for and with families called technology probes. Technology probes are simple, flexible, adaptable technologies introduced into families' homes with three interdisciplinary goals: the social science goal of collecting data about the use of the technology in a real-world setting, the engineering goal of field-testing the technology, and the design goal of inspiring users and designers to think about new technologies. 2) We developed and evaluated a system facilitating the sharing of calendar information between remotely located family members. Depending on their preference, some users enter information into computerized calendars, while others handwrite on digital paper calendars. All of the information is automatically viewable by everyone in the family. From 2000 to 2003 we participated in the Interliving project, a European Union sponsored project that brought together families and researchers in computer science, sociology and education with the goal of developing technologies that will encourage communication, collaboration and creativity. Researchers from the University of Maryland, the Royal Institute of Technology in Sweden, the Laboratoire de Recherche en Informatique de l'Universite de Paris Sud and the Institut National de Recherche en Informatique et Automatique in France joined together to create new technologies that support co-located and distance communication and coordination. We recruited 3 extended families in Sweden, 3 in France and one in the United States; There were workshops with colleagues and with families, numerous home visits and interviews. Based on the needs of the families each project team developed prototypes A strong focus of our work is to develop new participatory design techniques for working with families. One of those techniques is to use Technology Probes as a way to learn more about communication patterns in families and to serve as a catalyst to the design of new technologies. 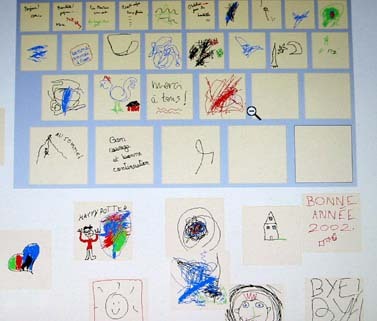 One of the technology probes in use in families was the interactive Family Message Board. The 7 families who worked with us. And our Interliving project partners in France and Sweden.